The Seahawks added Keenan Reynolds as insurance, waiving former WSU standout Shalom Luani to make room on the 53-man roster. Seahawks coach Pete Carroll said Tuesday “it would be a pretty big accomplishment” for Doug Baldwin to play Monday night against the Chicago Bears, which means his streak of 89 straight games played dating to the 2012 season — the fourth-longest for a receiver in the NFL — will likely come to an end. But the typically optimistic Carroll didn’t completely rule out Baldwin, who suffered a sprained MCL on his right knee against Denver Sunday, might be able to play against the Bears. While that may not be realistic, the bigger picture is that Carroll doesn’t appear to think Baldwin will be out long — a two to three weeks or so seems to be the general expectation. Seattle, though, added depth in case Baldwin can’t play this week or the next few, signing Keenan Reynolds from the practice squad. 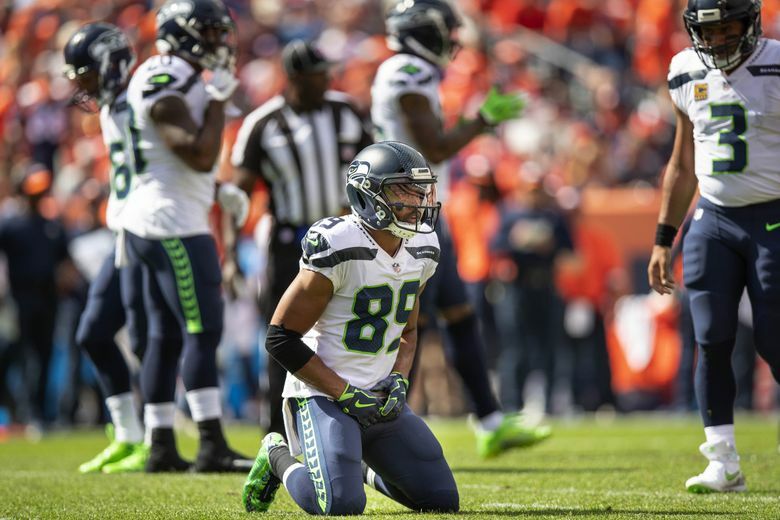 To make room on the 53-man roster Seattle waived safety Shalom Luani, a former Washington State standout acquired from the Seahawks the weekend before the season for a 2019 seventh-round draft pick. The pick was not listed as conditional. Luani was not active for Sunday’s game at Denver. Reynolds, a quarterback at Navy who has made the transition to receiver at the NFL level, saw ample action during the preseason playing slot receiver, Baldwin’s primary position. Reynolds, who has been in the NFL since 2016 and caught four passes for 35 yards in the preseason for Seattle, has yet to play in an NFL regular season game. He was on the 53-man roster for the Baltimore Ravens for their regular season finale in 2016 but did not play. Asked if there was any concern about Baldwin not being able to come back from the injury — Baldwin sat out the preseason to rest his left knee — Carroll said no. Baldwin was hurt on a running play in the first quarter when Denver’s Domata Peko rolled up on him. He continued to play into the second quarter before being pulled out and saw just 11 snaps and did not make a catch in a game for the first time since 2013. Without Baldwin Seattle had just four receivers in the second half at Denver — Tyler Lockett, Brandon Marshall, Jaron Brown and David Moore. Lockett played all but one snap in seeing more time with Baldwin out, and Carroll also noted that the absence of Baldwin contributed to the team’s woes on third down as the Seahawks converted just two of 12. Carroll said the team could also consider using running back C.J. Prosise — who was a starter for two seasons as a receiver at Notre Dame before being moved to tailback — more in receiving roles to add more depth at that position. — Carroll said linebacker K.J. Wright is beginning a running program this week after having arthroscopic surgery two weeks ago but said it’s unclear if he will return for Monday’s game. “He’s very positive about it but I can’t tell you what that means for the weekend,” Carroll said. “I don’t know that yet.” Shaquem Griffin started at weakside linebacker in place of Wright but the Seahawks used Austin Calitro more there as the game went on and Calitro might get the start this week if Wright cannot go. — Carroll said it’s unclear if D.J. Fluker will play this week but noted again that J.R. Sweezy’s presence at that spot allows them to be patient with the return of Fluker, who hurt his hamstring in the third preseason game at Minnesota. — Carroll said DE Frank Clark was dealing with a sore elbow against Denver. — The Seahawks signed WR Malik Turner and CB Simeon Thomas to the practice squad, taking the places of Reynolds and DT Frank Herron — who was released. Turner had 91 yards on five receptions in the preseason for Seattle before being waived while Seattle claimed Thomas off of waivers from Cleveland after the preseason. Seattle waived Thomas last week to make room on the roster for Earl Thomas but it was known Seattle wanted to keep him around if he cleared waivers. Seahawks coach Pete Carroll talks about Doug Baldwin’s knee injury and what Seattle will do at receiver.